At Caulfeild Dental Centre, we’re very proud and fortunate to be members of BC’s own 123 Dentist – Community Dentist Network. 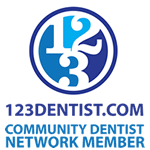 Caulfeild Dental Centre is a proud member of 123 Dentist, an online network of community dentists gathered together because of their ongoing commitment to their neighbourhoods. They have been selected for inclusion partly because they are a modern and caring dental facility as well as because they deliver an exceptional level of dentistry treatments. The network simplifies the search for a dental provider for both residents who have recently relocated to the West Vancouver area as well as those individuals who are simply searching for a new dentist. Membership in 123 Dentist goes hand-in-hand with the commitment to practice modern dentistry in a caring environment. We promise to listen to our patients. From the very first time a patient connects with any of the practices in our 123 Community Dentist Network, we will listen to our patients’ needs and tailor their care with our findings. Our goal is to provide our patients and their families with dental care in a warm caring environment. We promise to educate our patients. We give our patients the tools and advice they need to prevent dental disease – and we do so without confusing jargon. We’ll invest the time it takes so that our patients are comfortable, confident, informed and empowered. We promise to be family friendly. The practices in our network are family-friendly and designed to be a place where kids want to come and visit. We promise to have ultra-modern, relaxing practices. Our dental practices reflect modern design and décor to create a soothing, modern ‘spa-like’ look and feel. We invite our patients to consider us as their home away from home, and to consider us a part of their family. We promise to use leading edge technology. The skilled use of leading edge technology enables us to solve our patients’ dental and overall health needs in a rapid, comfortable and safe manner. We promise to support our patients’ mobile lifestyle. Patients who relocate can easily have their patient file transferred to another practice in our 123 Community Dentist Network. We handle all of the paperwork. Visit our West Vancouver Dentist profile on 123dentist.com.